A world-class dressage horse treated successfully at the University of Florida for an irregular heartbeat has rediscovered his rhythm and returned to international competition. 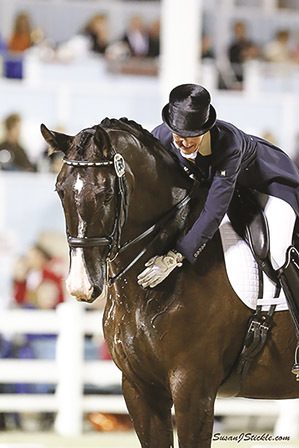 His proud trainer, Kelly Layne, a member of the Australian team at the 2006 World Equestrian Games in Germany and now a Wellington, Florida resident, is thrilled with Udon P’s comeback. She hopes he’ll pick up where he left off before his cardiac problem disrupted their training and that the 14-year-old Dutch Warmblood will qualify for the 2016 Summer Olympics in Rio de Janeiro, Brazil. “He’s a high-level athlete, but what’s interesting to me is the fact that his owner, in concert with his trainer, embraced his problem, when many people would rather not discuss their animal’s health conditions publicly,” said Chris Sanchez, D.V.M., Ph.D., an associate professor of large animal internal medicine at the UF College of Veterinary Medicine and a member of Udon P’s care team. “This horse’s owners took the opposite approach — they have taken this as a learning opportunity and even developed a heart-themed freestyle for his return to competition,” Sanchez said. Layne attributes Udon P’s success to his, well, exceptional heart. Known by his stable name, Noodles, Udon P arrived at UF’s Large Animal Hospital in April 2014 as a rising star in the world of dressage, a competitive equestrian sport during which riders guide a horse through a series of complex movements aimed at developing obedience, flexibility and balance. 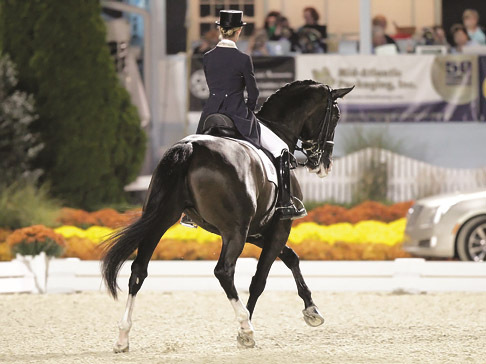 He was competing at the Grand Prix level and had recently won an international freestyle event, in which the horse’s movements are choreographed to music, in Wellington. Rider and trainer Kelly Layne strokes Udon P. after he successfully completed a Grand Prix freestyle half pass test during the Dressage at Devon horse show in September 2014. But fate intervened, shortly before Layne and her husband, Steve, were going to fly the horse to Normandy, France to represent Australia in the World Equestrian Games. He began showing signs of distress, including bleeding from the nose, coughing and unexpected gait changes. The Laynes’ veterinarian, Meg Miller Turpin, D.V.M., diagnosed atrial fibrillation, otherwise known as an irregular heartbeat. She referred the horse to UF’s Large Animal Hospital for a procedure known as electrical cardioversion. The facility is the only equine veterinary hospital in Florida capable of providing the procedure. The Laynes pulled Udon P from competition and focused on their horse’s health. Although the horse sailed through the procedure, his recovery back home in Wellington was somewhat rocky, Layne said. About six weeks after the horse’s discharge from UF, a large thunderstorm brought gusty, cool air to Wellington. For Layne, it was a pivotal event. “Perhaps it was the combination of the cooler weather and the storm, or maybe it was just time, but Noodles switched on and since that moment has never missed a beat, both figuratively and literally,” she said. To celebrate his return to competition, Layne collaborated with a British composer to create a freestyle routine consisting of songs that have the heart as a theme. The routine was first performed in January, when Udon P was back in competition. Udon P is “coming along nicely” for the 2016 competitive season, but Layne is equally excited about her horse’s continued good health and attitude. 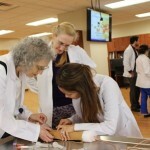 Several supporters of the college gathered recently to experience what life as a UF veterinary student might be like. 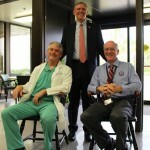 Two of the college’s endowed professors received chairs inscribed with their official titles during a special presentation. A world-class dressage horse is back in competition after successful treatment at UF for a heart condition. 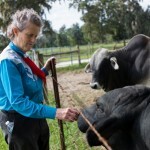 Renowned author, livestock behavior expert and autism advocate Temple Grandin spoke in Gainesville and visited UF in late September.